Summer restaurant Bistro Telakka opened it’s doors just before MayDay. First warm weekend in Helsinki and had to have late lunch there. 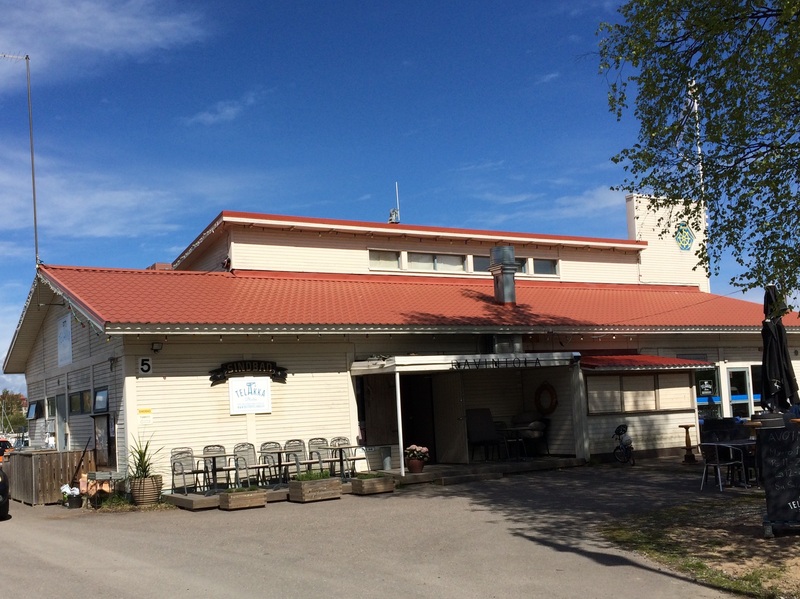 Telakka operates in the premises of Yacht Club Sinbad like Blue Peter in HSK. By the way, Telakka means shipyard in English. Restaurant renews its menu every summer and this year it seemed to be very promising. More ambitious and more vegan versions. 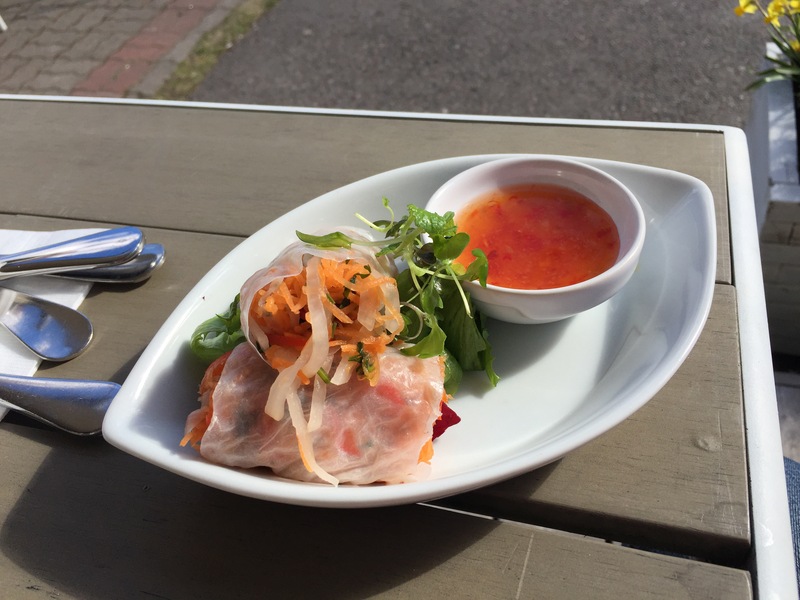 For starters ordered Vietnamese summer rolls, ginger-sweet chili dressing. Extremely healthy version of so called spring rolls but as it is summer (almost), rolls were cold, not stir-fried as spring rolls usually are. Carrot dominated as filling and coriander as a taste. Promising start as said before about the menu. Main courses enjoyed this time were Salmon and tiger prawn smoked at Telakka, asparagus, summer potatoes and lime hollandaise and Roasted Cauliflower Ras el Hanout, warm soy bean-millet salad, lemon yoghurt. Fish dish looked luxorius as prawn was placed on top of salmon. Salmon was perfectly smoked, not too dry and very soft. Summer potatoes will hopefully be new ones when they are available because of the name. Fried potatoes are not that summery. Ras el hanout or Rass el hanout is a spice mix from North Africa. It plays a similar role in North African cuisine as garam masala does in Indian cuisine. Light and tasty dish perfect for a summer day, but it was more like a salad or a started dish when talking of the serving size. Avarage price of wine bottle on short list is about 35€, which is really affordable concerning wine prices in Helsinki restaurants in general. 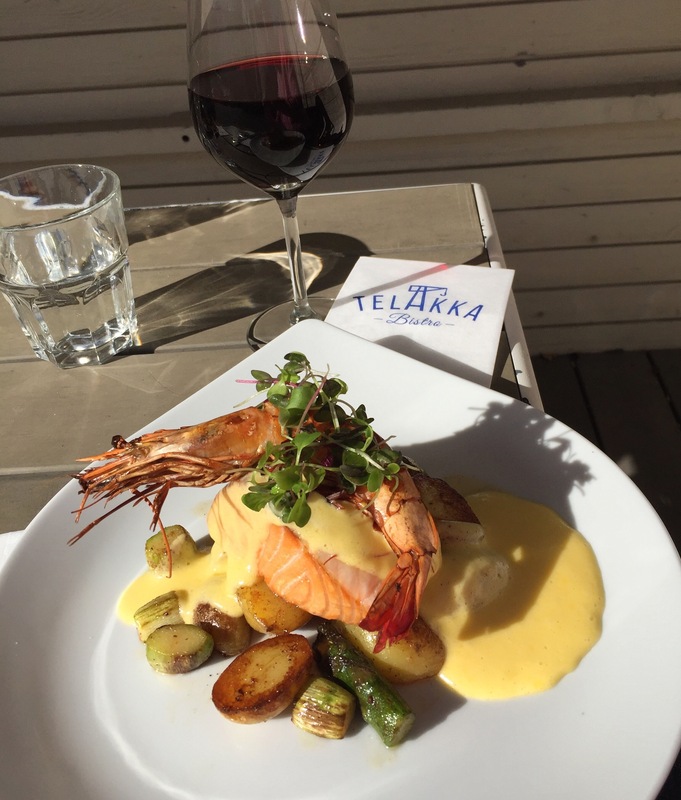 Telakka bistro is excellent supplementary dining place in Lauttasaari. 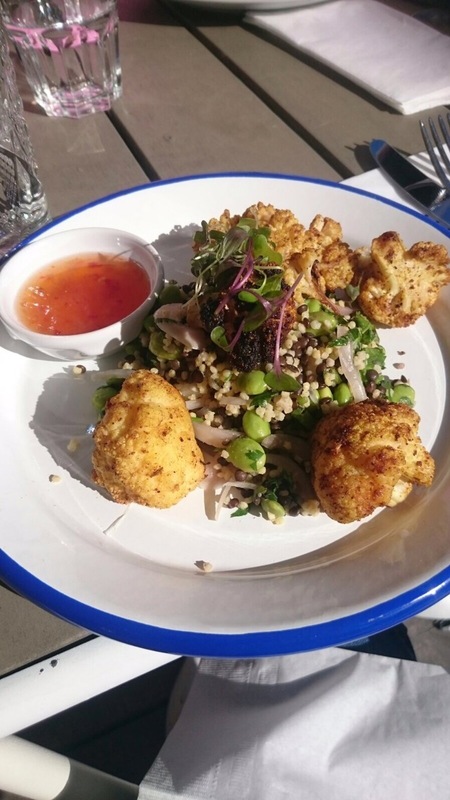 Food is excellent when it comes to outlook and taste. With existing prices bistro is quite expensive compared to size of portions and the interior of restaurant. Terrace outside tempts to dine outside but as May has been one of the coldest in Finland so far, one should have dine inside. We were lucky to have sunny afternoon and could eat at the terrace. It is a little bit difficult to review service as you have to order from the bar inside. Portions are brought to the tables, no need to pick them by yourself. I often go here in the summertime, nice to see it mentioned.